Years ago, just after we first met, The Fella went on a trip with his cousin to Poland. While international travel broadens most people’s minds, The Fella came back with just one word (which he repeated a LOT) and significantly less brain cells. The word was tatanka. Or to be more specific: Tatanka! Tatanka! Tatanka! Tatanka! Tatanka! Tatanka! 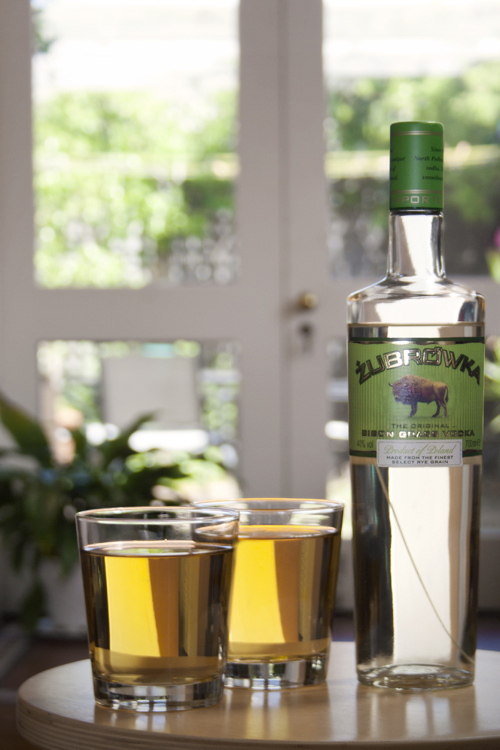 Tatanka is a cocktail made with a very special type of vodka, Żubrówka is a Polish brand that is infused and flavored with bison grass. It tastes like no other vodka you’ve ever had, as in, it actually tastes nice and not even slightly like paint stripper. So when I saw a bottle in our local liqueur shop, I wasn’t even slightly deterred by the $49.99 price tag (it costs about 20 quid at home) and I snapped it up. All the tatanka recipes I found on-line called for ice. However I have it on good authority from a Polish friend back home that using ice is a faux-pas, instead you should use super-chilled vodka and juice. The Polish can get very touchy about their vodka and it is mostly drunk undiluted and unadulterated. Mix together in a large glass and drink. Repeat, a lot, until singing commences.